Pokemon GO was launched a few weeks back and it has already become a global phenomenon with people taking to the streets to catch the Pokemon. I am pretty sure that you too want to play the game which is available in Google Play Store. However, if you are not able to download the game from the store, then you can download the Pokemon GO APK file and install it on your Android device manually to start catching various Pokemon and become a trainer. The latest version of the game, Pokemon GO 0.29.2 APK has been released and is available to download. With the game installed on your device, you will be able to go out and explore various places and catch different kinds of Pokemon. Catch as many as you can to level up and fight in gym battles to claim your spot in the gym. Moreover, you can evolve your Pokemon, hit the Pokestops and make friends with people that are trying to catch them just like you. So, check out the features of the game and then start exploring your town to find as many Pokemon as you can. The game has been downloaded on millions of devices and the number is going to rise as it is launched in other countries. If you don’t take the initiative and start playing the game, then there are high chances that other players from your town might catch strong Pokemon and claim the gyms leaving you far behind. The game is absolutely free to download and play. You simply need an active Internet connection and your device must have GPS for the game to work properly. Walk around and explore various place to encounter different kinds of Pokemon. To catch a Pokemon, you simply have to throw a Pokeball at them. Time it right to earn additional XPs. You can also see which Pokemon are close to your location in the bottom-right corner of your screen. The Pokemon with the most footprints are far away and with one or no footprints are very close to you. You will be able to find water-type Pokemon at lakes, oceans etc. and similarly other Pokemon in their suitable environments. The historical monuments and structures, art installations and other monuments in your area might be marked as Pokestops. You can visit these Pokestops to get Pokeballs, potions and other items. Catch as many Pokemon as you can and when you have enough candies, you can evolve your Pokemon. Go to a gym and battle with the Pokemon stationed there. When you win the battle, you will be able to claim the gym after which you will have to leave your strongest Pokemon there and if you are able to hold the gym for more than a day, you will earn Pokecoins and other items. These are not the only features of the game as there are many more things to explore and you will have to download Pokemon GO APK and play the game to find out everything. The best part about the game is that it is an augmented reality game that takes you out in the real world and gives you a chance to interact with other like-minded people that are trying to catch Pokemon themselves. If the game is available on Google play Store, then you can download it directly on your smartphone or update it to the latest version, if it is already installed. But, if you are unable to download the game or update it for some reason, then you can use the below link to get the latest version of the game’s APK file. 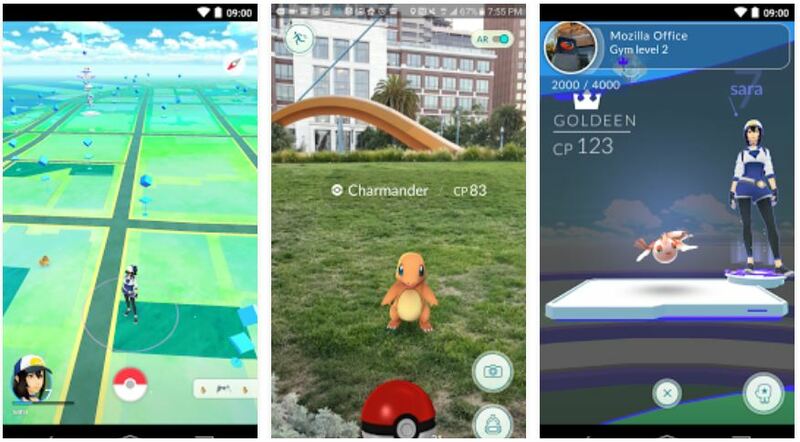 You can download the most updated version of the Pokemon GO game by clicking here! After you have successfully downloaded and saved the APK file of the game on your smartphone or tablet, you need to enable the Unknown Sources by going to Settings > Applications/Security on your device to allow the installation of the game. Now, go to the downloads folder and install the game manually. This is how you can download Pokemon GO 0.29.2 APK for Android! If you liked the article and you are currently playing the game, then share it with your friends who might join you in your quest to catch’em all.